The recent step back from the brink of the Syrian showdown has led to many comparisons, admiring and otherwise, with John F. Kennedy's handling of the Cuban Missile Crisis. 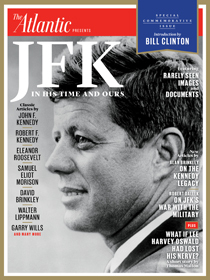 That is as good reason as any to highlight the appearance of the Atlantic's stand-alone commemorative issue on JFK, on sale at newsstands and in electronic edition now. I had nothing to do with this project and saw it only when it was complete, so I can come right out and say that it is an exceptional and physically beautiful piece of work, which I think will set a high standard for the Kennedy appreciations we are going to see on the 50th anniversary of his death. ... and, the main thing may be the photos. I've seen photos of John Kennedy and his family all my conscious life, but this issue contains quite a few I had never seen before. This is worth checking out. By which I mean, you should buy it.